I know I've been overloading my blog posts with Halloween stuff. So, I thought I'd give you a little bit of a break today and treat you to . . . RAINBOWS AND BUTTERFLIES! This is a card that my girls created at the September 2016 Stamp-In Workshop. Initially, when I was planning my projects for the August Workshop, I intended this to be the card they would make. Then, however, after it proved to be a bit much for a workshop project, I decided to go ahead and make it a unique framed piece. I loved being able to use actual music as my background, and a black diecut with the Swirly Scribble Thinlits to act as the music "staff". 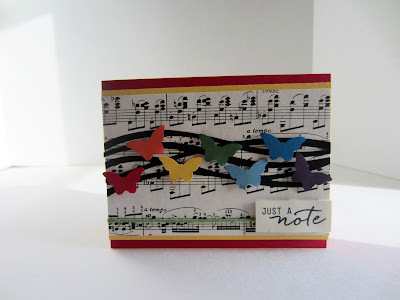 To continue with the music theme, I used the "just a note" stamp from the beautiful stamp set that comes with the Watercolor Wishes Card Kit (pages 8 and 9). Popped up over some thick baker's twine, it was the perfect addition. 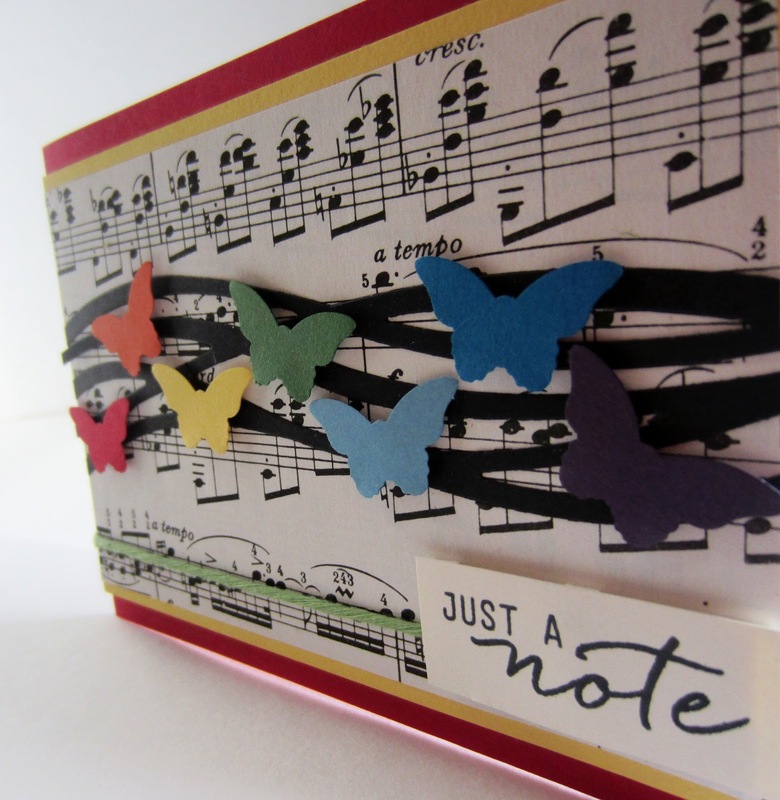 The combination of the popped-up butterflies, the sentiment and a little from the baker's twine, the card has some dimension. Not a lot. But pleasing enough. Following are the instructions on how to re-create this card on your own. Have fun! Fold a 11" x 4 1/4" piece of Real Red cardstock in half, creasing well with a bone folder. 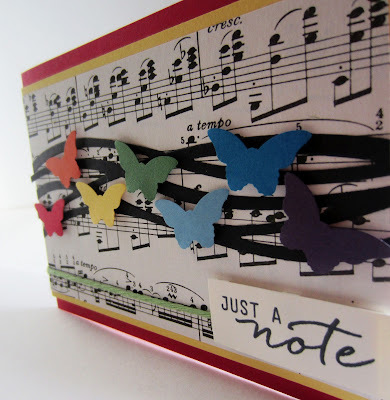 Add a 3 1/2" x 5 1/2" piece of music to a 3 3/4" x 5 1/2" piece of Daffodil Delight cardstock. Wrap a 6 1/2" piece of Wild Wasabi Thick Baker's Twine around this piece, about 1/2" from the bottom of the yellow portion. Adhere this to the card base. From Basic Black cardstock, cut the long scribble from the Swirly Scribble Thinlits. Trim the ends as you wish so it is the same width as the card. Adhere this over the music so it is somewhat raised from the center point. 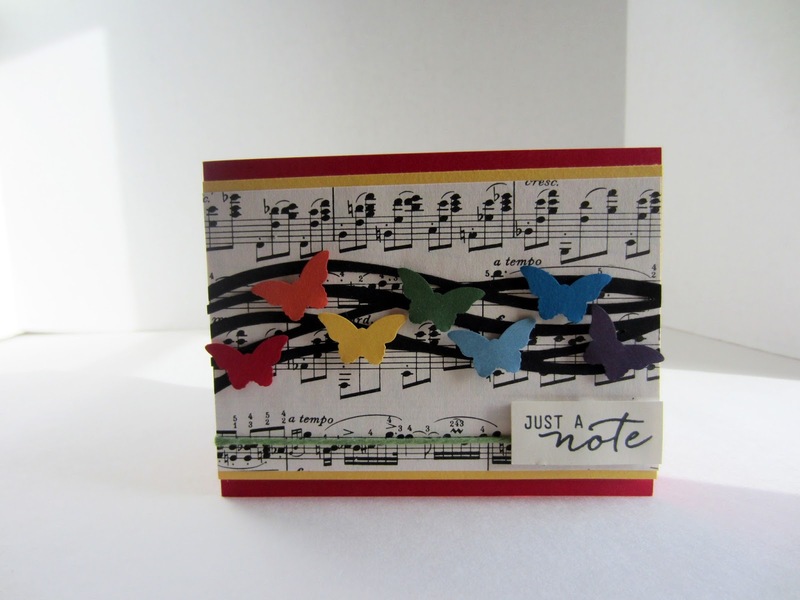 From each of the rainbow colors, use the Bitty Butterfly Punch to create the butterflies. Before adhering them in place, position them across the black scribble as you think you would like them. When you are pleased with the arrangement, adhere them, one by one, with a bit of Dimensional on the backs. On a 3/4" x 1 3/4" piece of Very Vanilla cardstock, stamp "just a note" in black ink. Adhere this over the Baker's Twine with Stampin' Dimensionals. Beautiful! I love the bright colors! Thanks for sharing on the Pleasures of the NW’s DIY party-and don’t forget to leave a comment at the party – Next week’s features that also leave a comment get pinned and tweeted! Beautiful! I have not seen such an adorable card! 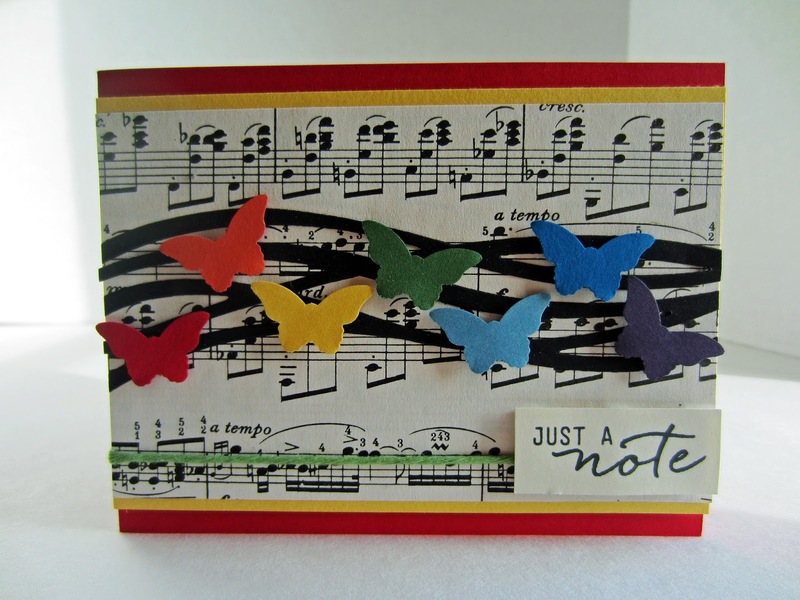 Anytime is a good time for rainbows and butterflies! Your cards are so adorable and this one is so lovely. I like the rainbows and butterflies.